I am a little late to the podcast game, but there are a fair few that I’ve fallen in love with. Some of these are about post production and filmmaking, some of them are focused on entrepreneurship and creativity. Either way, they’re all worth a listen. In this first section I’ll point to a few post-production related podcasts I like to listen to when I can, although I actually spend most of my time listening the podcasts in the next section! If you’re after even more podcasts from the world of filmmaking check out this new list from the folks at StudioBinder. The Cutting Room podcast from Gordon Burkell’s excellent AOTG.com is a treasure trove of insightful interviews with editors and filmmakers. There are (currently) 116 different interviews on the Cutting Room Sound Cloud page, which is probably the fastest way to scroll through all of the interviews. The Colorist Podcast is one of the best free resources I know of that gives you direct access to the thoughts and opinions of professional colorists working today. Created by colorist Josh Petok, it sort of follows up where The Coloristos podcast left off, which Josh also co-hosted, and features in-depth interviews with a different colorist every month. The podcast covers a range of topics from personal career trajectories to technical nuances to creative tips and tricks. If you’re interested in becoming a professional colorist this is a must listen! It is sponsored by both the Colorist Society International and colorist training site Mixing Light.com. Here is the latest episode with Light Iron founder and colorist Ian Vertovec. After 117 episodes film and TV editor Zach Arnold’s Fitness in Post podcast has now been superseded by his new Optimize Yourself.me site and podcast. The original Fitness in Post show chronicled Zach’s passion for helping post production professionals prevent physical and creative burnout and live all round healthier lives. His post on why ‘sitting is killing you, and standing isn’t the answer‘, is an essential read. The new Optimize Yourself show takes this idea to another level and broaden’s it’s listen base to a wider context. Listening to both will be a transformative use of your time! Do it. Richard Taylor’s FCP Radio is now moving past the 50 show mark and also has hit over 1 million downloads (split with another podcast he produces) and continuing to deliver entertaining and insightful conversations with some of the most vocal FCPX professionals working today. In episode 54 a gang of FCPX editors and trainers get together to discuss the latest release of FCPX 10.4. 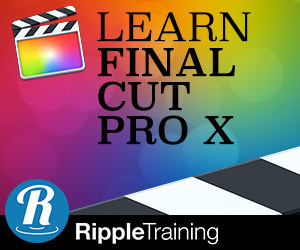 Richard is joined by Steve Martin and Mark Spencer from RippleTraining.com along with Patrick Southern from Lumaforge and FCPX editors Bill Davis, Gabriel Spaulding and Felipe Baez. The show is sponsored by Lumaforge, who make the amazing Jellyfish. Although I love working in and writing about post production, I also love listening to, reading about and being curious around interesting ideas, technology and people from outside of post. Yes, it’s really true. This short list of podcasts are some of my all-time favourite never-miss-an-episode-listen-to-some-of-them-several-times podcasts. Listen to them all – you’re in for a treat! This is currently my favourite podcast, which comes out pretty much weekly, telling the personal stories of the founders behind some of the biggest brands on the planet. I would highly recommend checking out these episodes in particular. These are direct download links. I’ll just stop there… there are just too many great episodes! This new podcast reveals how screenwriter John August came to write his first novel, a children’s book called Arlo Finch in the Valley of Fire, and the journey of publishing a book, as told from the inside. It’s a really well structured, produced and delivered podcast, revealing ‘how the sausages are made’ in the publishing industry. The first two seasons of Start Up are incredible. They’re the model on what much of Gimlet media’s podcasts (and many other shows) are based. Start Up season 1 takes you inside the journey of Gimlet Media founder Alex Blumberg to create Gimlet Media from scratch. I binge listened to the whole thing in a couple of days. Season 2 continues the journey of the company with some interesting insights and challenges as they grow. After that the seasons mostly track with other businesses for a season, or just a show, and are well worth a subscription. Another great show from Gimlet Media, The Pitch is essentially a podcast version of ‘Dragon’s Den’ or shows like that. Although the investors almost never invest, somehow that doesn’t detract from the show being an enjoyable listen. The host, Josh Muccio, does a great job of telling the stories, crafting the drama and playing referee. Plus I’ve discovered some really interesting start ups listening to the show. Reid Hoffman is the founder of LinkedIn and, after selling it for $26 billion dollars, now seemingly for fun runs the Masters of Scale podcast. This features some of the biggest names in Silicon Valley sharing tips and insights on business life, especially when it comes to scaling your company to it’s biggest possible size. Possibly the best serialised podcast of all time. S Town is an incredible display of storytelling, investigative reporting and a compelling personal journey. I can’t recommend it more highly. Not one to listen with kids around though. So these are my favourites, hit the comments and tell me what I’m missing out on! Do you listen to FCPX Grill https://t.co/xhmmHuYrm6 ? Or @benconsoli https://t.co/wJviwDwTl6 ? Good podcasts. Ah ah! I didn’t know it was also a podcast. Good times. Awesome list. I have a new podcast which I launched last year. The Pro Video Podcast covers all areas of the industry. Guests come from all areas of professional video content. Episodes cover filming, editing, music, color grading, 3D, motion design, sound design, visual effects, VR, AR, workflows and future technologies. Lots of insights into their work and carers. Plus tips and stories on creating Film, TV, Broadcast, Online Video, VR and so much more. Past guests have been leading figures in VFX such as Mike Seymour. Top Motion Designers like Tim Clapham and Ryan Summers. Director, Immersive Media at Adobe Chris Bobotis. The ‘Tickled’ Film’s Co-Director Dylan Reeve and so many other talented professionals from in-house WWE motion teams to the Mill Londons VFX lead. Sounds awesome! Thanks for sharing Blair. Super Secret Filmcast and Wandering DO are also good. I wish the Art of the Cut interviews were available as a podcast….